Medical authorities grew increasingly concerned throughout the 1970s about continued smoking, including by youth. They attempted with only moderate success to enlist doctors to warn people about the dangers of smoking. Health educators and psychologists stepped in to work out how best to discourage children from experimenting with cigarettes, and to try to help smokers to shake off the grip of their tobacco habits. Much was learnt about smoking as an addiction and about the process of smoking cessation. Brochures were produced20 and courses were run by bodies such as the state Cancer Councils and the Seventh Day Adventist Church. However, giving up smoking during the 1970s was seen in much the same category as becoming a vegetarian or a tee-totaller, and little dent was made in smoking rates in the face of the powerful commercial forces that continued to promote cigarettes. 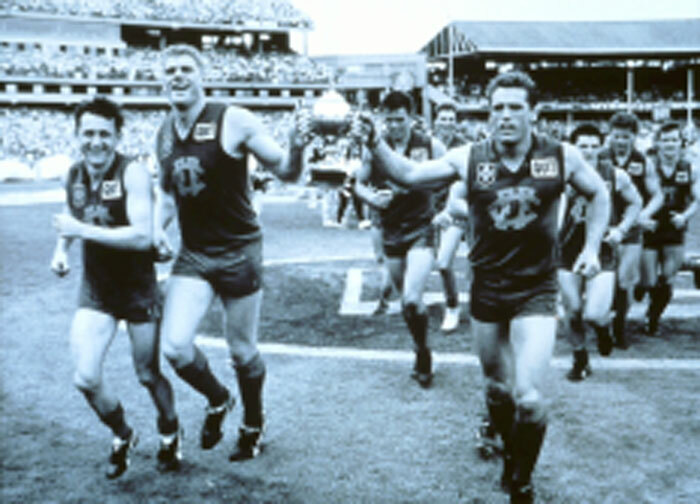 A pioneer in using behavioural science to adapt commercial marketing techniques for public education, in the late 1960s the Anti-Cancer Council in Victoria organised prominent Victorian Football League (VFL) footballers to promote the quit smoking message.i In 1971, the Victorian Anti-Cancer Council traded on its respectability to push boundaries by securing community service spots for what broadcasters no doubt expected to be advertisements to promote cancer screening, but instead were hilarious spoofs of cigarette advertisements.ii The advertisements were quickly taken off air after complaints from tobacco companies, but prompted a flurry of news coverage that helped to build support for amendments to broadcasting legislation that would eventually see the end of TV advertising of cigarettes in Australia. Quit campaigns were underway in all states and territories by the late 1980s, sharing advertising materials and running a national phone line to advise and support people quitting smoking. Health education in schools remained a major theme but was complemented with more vigorous efforts to stop retailers from selling cigarettes to children—refer Chapter 5. 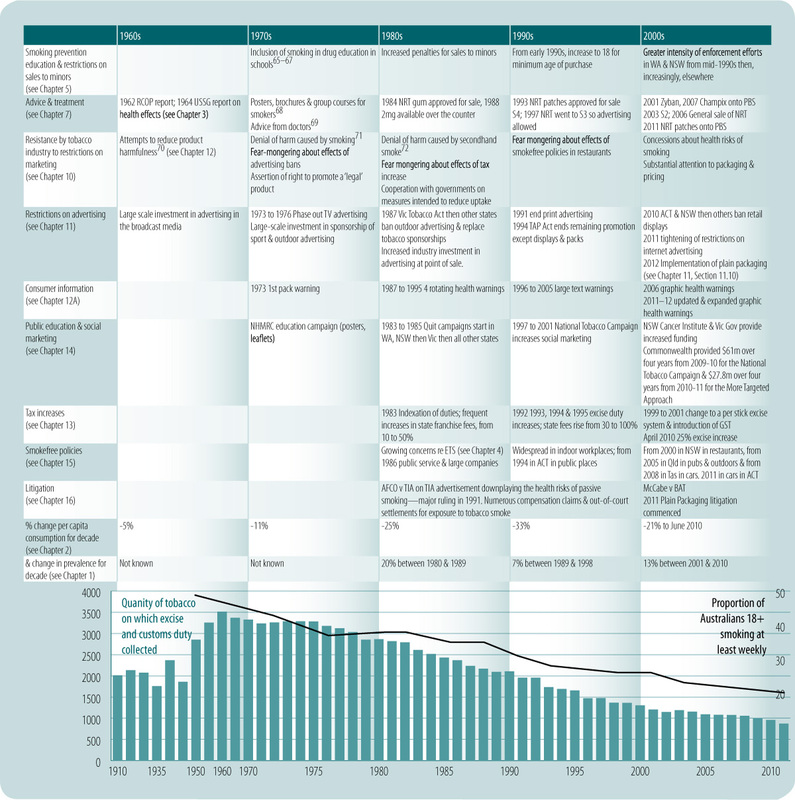 A stalling of the decline in prevalence occurred in the mid-1990s, corresponding with reduced expenditure on public campaigns,34 but a major injection of funds through the National Tobacco Campaign in 199735–37 kick-started the decline in smoking38–40 and campaigns over the late 2000s were funded at more commercially realistic levels in most states—see Chapter 14. Smoking rates resumed their downward trend. Taxes on large packets of cigarettes increased substantially in 1999, with further increases associated with implementation of Australia's Goods and Services Tax between June 2000 and February 2001—see Chapter 13. Governments continued to chip away at remaining forms of promotion, with all states outlawing advertising of products at point of sale in the early 2000s and then, towards the end of the decade, outlawing the display of products altogether—see Chapter 11, Section 11.9. Smoking cessation aids were listed on the Pharmaceutical Benefits Scheme in 2001, 2007 and 2011 and a variety of phone, internet and SMS programs have since been put in place across the country to support and encourage smokers in their quit attempts—see Chapter 7. These programs are soundly based on knowledge about addiction, the process of smoking cessation and the predictors of success in quitting that has continued to grow since the 1970s. However, the addictive properties of nicotine and the degree to which smoking is entrenched in smokers' lives continues to result in very high rates of relapse. During the 1980s smoking came to be seen not just as a health issue, but also as a matter of consumer rights: that smokers have the right to be informed not just about all the diseases caused by smoking, but also about the addictive properties of nicotine and about the nature and effects of chemical residues in tobacco leaf and substances added during manufacture—see Chapter 12.41 The consumer rights perspective translated into a number of legal actions against tobacco companies based on the premise that tobacco products are more harmful and more addictive than they need to be, and that companies failed to adequately warn consumers about the dangers of their use. The understanding that secondhand smoke is dangerous led courts and various tribunals concerned with workers' health and safety to award compensation for sickness arising from exposure to tobacco smoke in the workplace, which sent a powerful signal to governments and the private sector about the need to protect citizens from exposure to secondhand smoke—see Chapter 16. The courts also demonstrated the power of litigation by upholding laws designed to restrict the promotion of tobacco products and, potentially, of securing resources to fund tobacco control activity. The need for legal expertise in ensuring that law more generally works in the interests of public health is now well recognised. But reducing smoking is not just a matter of economic efficiency; smoking is also central to concerns about social equality. For several decades, smoking rates have been substantially higher among those who are educationally and socially disadvantaged—see Chapter 9. Reducing smoking and the attendant health costs, financial stress and intergenerational poverty associated with spending on tobacco products has become a major social justice issue, particularly among Australia's Indigenous population—see Chapter 8— and among those with living with mental illness or problems with drug and alcohol use. Tobacco use among the homeless, among those in correctional facilities and among others facing multiple and severe disadvantage is particularly high, and these groups have also been identified as priorities. In the 50 years between 1962, when the Royal College of Physicians released its landmark report on the hazards of smoking,10 and 2012 when this fourth edition of Facts and Issues is going on-line, the prevalence of smoking has more than halved—see Chapter 1, Section 1.3, and per capita consumption has declined by more than 75%—see Chapter 2, Section 2.3. In line with the findings of research throughout the rest of the world,51 studies measuring short-run effects have been able to attribute reductions in smoking prevalence in Australia to increasing taxes,52,53 greater expenditure on social marketing campaigns54,55,53 and smokefree policies.56 Multivariate analysis of the effects of policy on prevalence of smoking among teenagers in various Australian states from 1990 to 2005 also indicates strong effects for increases in the price of tobacco products, expenditure on social marketing and comprehensiveness of laws mandating smokefree policies in public places.57 Indeed, much of the decline in smoking in Australia since the late 1990s appears to be attributable not to more people quitting, but to fewer young people taking up smoking in the first place.58,59 However, such studies tell only part of the story. Continuing progress requires a comprehensive approach to maintain momentum and ensure that government efforts on one front are not undermined by more vigorous efforts and greater investment by tobacco companies on other fronts. This is the fourth edition of Tobacco in Australia: facts and issues, a project originally conceptualised by Paul Magnus, a founding director of Action on Smoking and Health Australia (ASH). 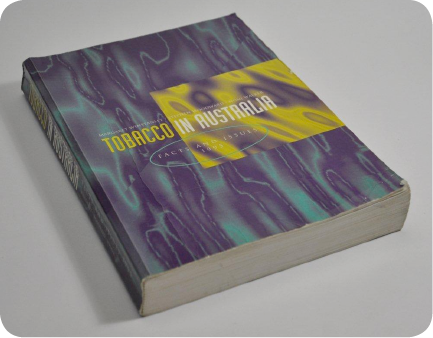 The first edition (1989),191 compiled by Margaret Winstanley and ASH Director Stephen Woodward, and the second edition (1995), by Winstanley, Woodward and Noni Walker192 rapidly became the standard compendia of tobacco control related information for Australia. The third, on-line edition edited by Winstanley and Michelle Scollo (2008)193 greatly expanded the earlier editions and became one of the largest and most comprehensive repositories of information and analysis about tobacco control in the world. Smoking and tobacco control must surely be the most exhaustively researched and thoroughly documented of any public health problem and any public policy initiative in history. This fourth and once again vastly expanded edition of Tobacco in Australia consists of 20 chapters summarising the health effects of smoking, documenting the history of tobacco control in Australia, describing past and current trends and explaining major policy topics from an Australian perspective. It contains 308 sections and 899 subsections, 10% more than in the previous edition and indicating a considerable widening in breadth. Even more significantly the word count has increased by 60% to more than half a million words, and the number of references by 120% to almost 8000. This expansion of content reflects both the increasing depth of understanding of tobacco control in Australia and internationally, and the increasing sophistication required to develop, argue the case for and defend policy in the political and legal realms both locally and internationally. The fourth edition also differs from the previous three in that it is only produced on-line. Australia became a Signatory to the World Health Organization (WHO) Framework Convention on Tobacco Control (FCTC) on 5 December 2003, soon after the Convention opened for signature. Australia was one of the first 40 countries to ratify the FCTC, and so became a full Party on 27 February 2005, the date on which the FCTC came into force. Australia is thus legally bound to perform, in good faith, the full range of obligations set out in the Convention.iii Just prior to the release of this 4th edition of Tobacco in Australia: facts and issues, the High Court of Australia handed down its decision upholding world-first, groundbreaking laws mandating plain packaging of tobacco products.195 Cigarettes and other tobacco products in plain packaging with unmissable health warnings started appearing in shops throughout the country in September 2012—see Section 11.10 for detailed discussion. In 2008, all governments in Australia signed the National Healthcare Agreement196 with the ambitious goal of reducing adult daily smoking prevalence to 10% and halving the adult daily smoking rate among Aboriginal and Torres Strait Islanders by 2018. As the 4th edition of the compendium was going on-line, the Commonwealth and state and territory governments had just approved a new National Tobacco Strategy 2012–2018iv which is much more far-reaching than its predecessor197–199 and aims to strengthen and extend activities in all the major streams of tobacco control over the six years to 2018. Advancing all these initiatives will require major political will, a great deal of effort from many, many people and, no doubt, an awful lot of writing! With each section of Facts and Issues produced by people who are highly knowledgeable in their fields, and thoroughly referenced with urls wherever available, it is to this last task in particular that we hope this publication makes a major contribution. iii	Australia submitted its first report to the Conference of Parties (COP) on its implementation of the FCTC in February 2007, and its second report in November 2010—see Chapter 18, Section 18.9 for further details. 9. Wynder E and Hoffmann D. Tobacco and tobacco smoke: studies in experimental carcinogenesis. New York: Academic Press, 1967. 10. Royal College of Physicians. Smoking and health: a report of the Royal College of Physicians on smoking in relation to cancer of the lung and other diseases. London: Pitman Medical Publishing Co Ltd, 1962. 12. Royal College of Physicians of London. Smoking or health: a Report of the Royal College of Physicians. Tunbridge Wells: Pitman Medical Publishing Co Ltd, 1977. 19. Ferrence R. Deadly fashion: the rise and fall of cigarette smoking in North America. New York: Garland Publishing, 1989. 21. Walker R. Under fire. A history of tobacco smoking in Australia. Melbourne: Melbourne University Press, 1984. 22. Health Department Victoria. Ministerial Review into Health Promotion. Victoria: Health Department Victoria, 1985. 28. Makkai T and McAllister I. Public opinion towards drug policies in Australia 1985 to 95. Canberra: Department of Health and Family Services, 1998. 31. Mullins R. Public opinion on smoking and public places 2000/01. Melbourne: Centre for Behavioural Research in Cancer, The Cancer Council Victoria, 2002. 41. Brecher E and Brecher R. The Consumers Union report on smoking and the public interest. Mount Vernon, United States: Consumers Union of United States, 1963. 46. Hurley SF and Hartel G. The short-term impact of smoking cessation on myocardial infarction and stroke hospitalisations and costs in Australia. Melbourne: VicHealth Centre for Tobacco Control, 2004. 48. Scollo M. Towards an Australian national policy for the treatment of dependence on tobacco-delivered nicotine. Melbourne: VicHealth Centre for Tobacco Control, 2003. 59. Germain D, Durkin S, Scollo M and Wakefield M. The long-term decline of adult tobacco use in Victoria: changes in smoking initiation and quitting over a quarter of a century of tobacco control. 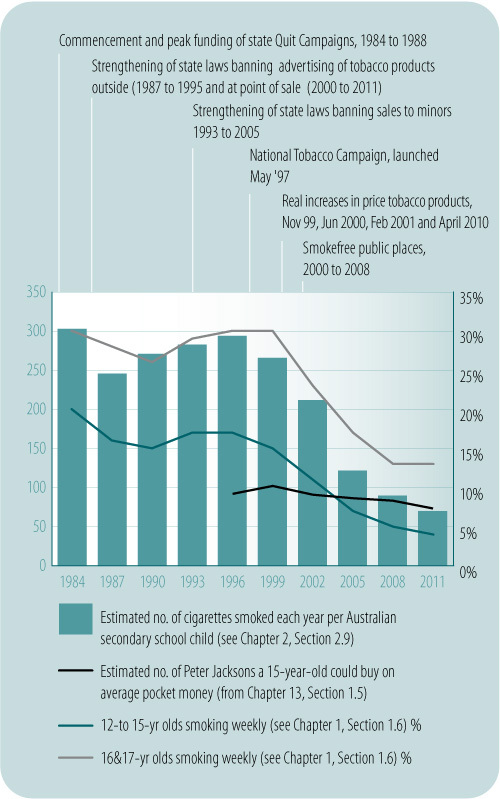 Australia and New Zealand Journal of Public Health 2012;36(1):17–23. 65. Falk E. Smoking control in Australia since 1975: an annotated bibliography. Sydney: Anti Smoking Project Group, Health Commission of New South Wales 1982. 66. Division of Health Education. Why don't elephants smoke? : and other burning issues/National Education Against Smoking Campaign. Sydney: NSW Department of Health, 1972. 70. Health GBISCoSa. Developments in tobacco products and the possibility of 'lower-risk' cigarettes. London: 1979. 71. Tobacco Institute of Australia, TIA Melbourne. Smoking and health: ten often asked questions (personal communication). 1983. 95. Australian Bureau of Statistics. Monthly tobacco excise receipts, Unpublished data. Electronic files provided to Michelle Scollo of The Cancer Council Victoria, 1996 to 2003. 175. Leo Stinson Schools Collection Manager, ABS Melbourne. Estimates of numbers of secondary school students aged 12 to 17 years (personal communication). Vicki White Centre for Behavioural Research in Cancer TCCV, 2006. 192. Winstanley M. Tobacco in Australia: facts and issues. 1st edn. Surry Hills, Sydney: ASH Australia, 1989. 193. Winstanley M, Woodward S and Walker N. Tobacco in Australia; Facts and issues 1995; Second edition. Carlton South: Victorian Smoking and Health Program, 1995.